Posted September 18, 2017 by Seán Kinane & filed under Hurricane, Labor, Latino, News and Public Affairs. 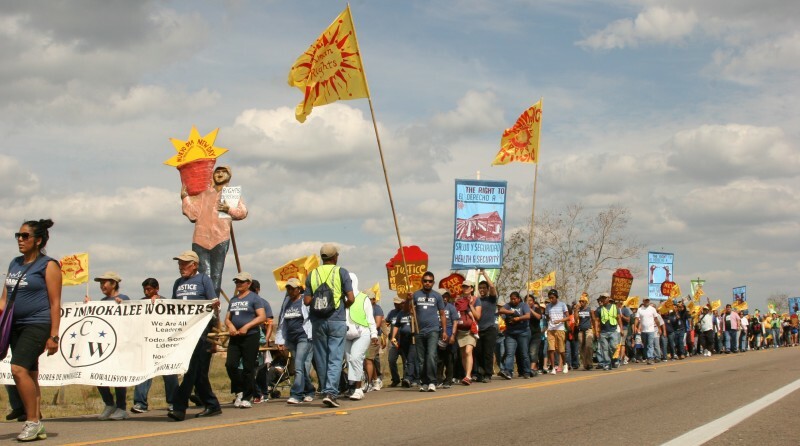 In the aftermath of Hurricane Irma, we hear how the migrant farming community of the Coalition of Immokalee Workers has been affected; and we hear from Tampa Bay residents upset at their power companies. We took phone calls; our guests was Roger Butterfield of the Student Farmworker Alliance. “When Hurricane Irma ripped through Florida, farmworker families throughout the state moved into survival mode. Those who could hurriedly packed suitcases with their most precious belongings and headed north, most with no particular destination, in search of a safe place out of the storm’s path. Most, however, had no choice but to stay home, seeking the safest place to ride out the hurricane, be it their bathroom, a nearby church, or one of the many shelters opened by each Florida county. Over one long night this past Sunday, Irma darkened millions of homes and businesses (affecting over half of the state’s population of 20 million people), caused billions of dollars in property damage, and took 26 lives in Florida as of this posting. We talked about what it’s like in the migrant farming communities of southwest Florida before, during and after Hurricane Irma. And about relief efforts. Food: fruit (fresh and dried), tostadas, canned beans, tuna, sardines, sausages, peanut butter and jam, bread; Toilet paper, Diapers, Feminine hygienic products; Underwear and socks; Water; CHAINSAWS; Gas; Big tarps. Items can be dropped off at 5107 Central Avenue in Tampa.